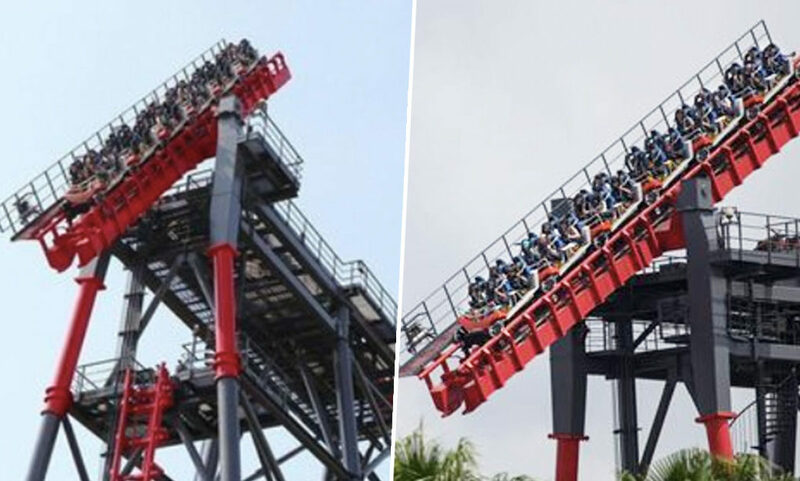 Roller coaster fans were left hanging face down over a 15-storey drop after it broke down. The world’s only tilting roller coaster, called Gravity Max, left 20 riders stranded and terrified when it malfunctioned on January 30. The roller coaster at the LIHPAO Discovery Land in Taichung’s Houli District in West Taiwan brings riders to the edge of a horizontal platform before it tilts the entire train 90 degrees. Known as the ‘Cliffhanger’, the roller coaster left its riders hanging face down longer than usual due to a misalignment. The train tilted forwards then backwards twice before it was finally righted. 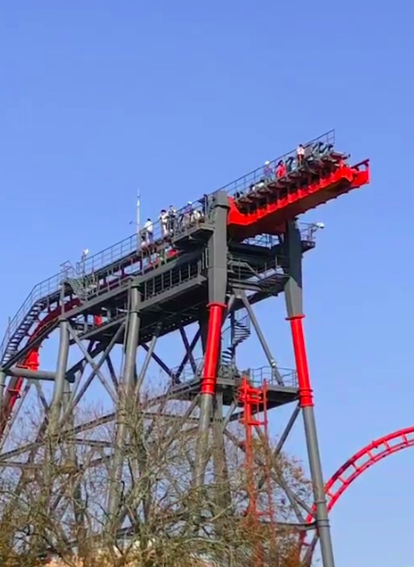 The 20 riders were then asked to leave the roller coaster platform via foot, with the ride reopening 20 minutes later following an engineering inspection. 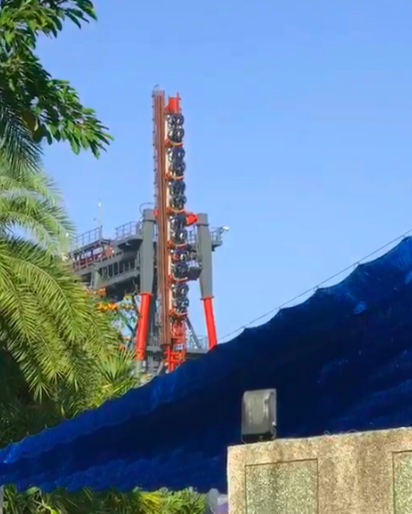 Wang Yung-hao, the theme park’s director, said engineers were satisfied the roller coaster’s fail-safe would prevent any riders from getting hurt. He revealed the fail-safe kicked in following a misalignment, preventing the train from being released with hooks holding it in place. The misalignment meant the train was unable to properly line up with the vertical tracks below. Yung-hao added misalignment can happen in strong winds, anything over six on the Beaufort scale, heavy rain or fog. The theme park director reassured visitors the ride is ‘100 per cent safe’, and gave each one of the 20 riders theme park coupons worth 150 TWD (£3.70) in compensation. Gravity Max first opened in 2002 and has a track length of 1,900 feet (580 metres). The roller coaster takes riders up to its highest point of 160 feet (49) metres, hitting speeds of 58 mph (94 kph). This year the world’s fastest, tallest and longest dive roller coaster will be opening up to the public. Canada’s Wonderland, in Ontario, is taking thrills to a whole new level with their new ride Yukon Striker. They revealed all on their website in August 2018 describing Yukon Striker as ‘the fastest, longest, tallest dive coaster’ in history. Situated in the newly themed area Frontier Canada, Yukon Striker will be the country’s first dive coaster and the park’s 17th coaster, placing Canada’s Wonderland among the world’s top three amusement parks with the most roller coasters. Yukon Striker promises an exhilarating journey along its 3,625 feet of mountainous track where guests will be treated to a spectacular view stretching to the Toronto skyline. The coaster features a ‘hold and dive’ element where riders will literally be hanging on the edge of their seats, on one of three wide, floorless trains, breathlessly awaiting the 90-degree, 245-foot drop. Once released, the coaster dives from zero to 130 kilometres per hour straight down into an underwater tunnel before soaring up over steel track, propelling riders through four dynamic inversions and gravity-defying weightlessness. This is the largest capital investment we’ve made in our park since opening. We’re excited to offer world-class thrills and a truly unique experience for our guests next year. Yukon Striker will be the centerpiece of our new themed area Frontier Canada, delivering exhilarating and record-breaking coaster elements like no other in the world. And to cap off our 2019 season, WinterFest will be a holiday event unique to Canada as our park transforms into a winter wonderland. You can expect magical holiday fun for guests of all ages. Yukon Striker is set to open this year.